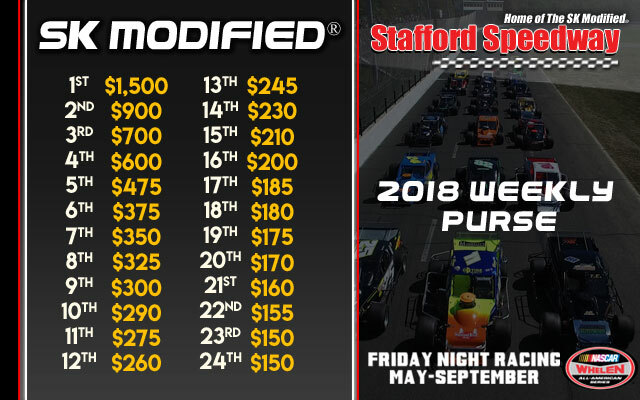 (Stafford Springs, CT)—Capping off a pre-season of improved purse structures, Stafford Speedway management is proud to announce the SK Modified® and Late Model divisions will be receiving an enhanced purse in 2018. These increases for the SK and Late Model divisions follow the previously announced purse increases for the SK Lights, Limited Late Model, and Street Stocks. 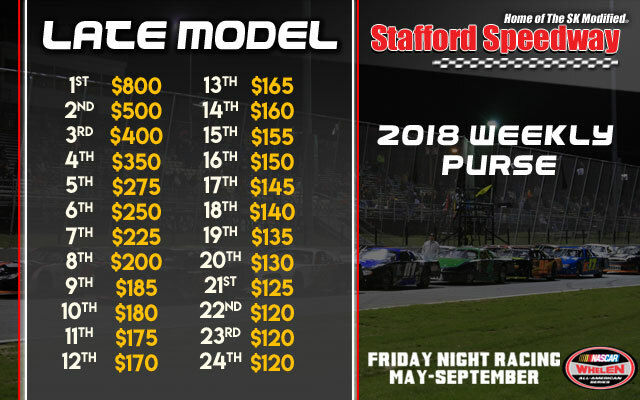 A full rundown of Stafford Speedway’s 2018 weekly purses can be found by CLICKING HERE. Both the Late Model and SK Modified® weekly purses will increase by just under 10% for the new season. 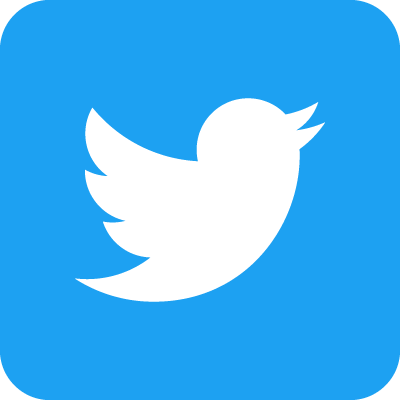 The SK Modified® division will have a base purse of $1,500 to win with a total purse of $8,560 while the Late Model base purse will be moved to $800 to win with a total purse of $5,375. Last place payout will move to $150 and $120 for the SK Modified® and Late Models respectively. With under 50 days till the NAPA Auto Parts Spring Sizzler and the official start to the 2018 race season at Stafford Speedway drivers and teams are busy preparing for the new season. In the SK Modified® division, 2017 track champion Keith Rocco comes into the new season as the heavy favorite after a dominant end to last season. The Late Model division is shaping up to be another highly competitive season with 7 of the 8 feature winners from 2017 returning to the division in 2018. Glen Reen, the 2017 Late Model champion will enter the season as an early favorite but will be contested by the deep field including former champions Michael Bennett and Tom Fearn. The 2018 Stafford Motor Speedway season kicks off with the 47th Annual NAPA Auto Parts Spring Sizzler® on April 27-29. Tickets for the “Greatest Race in the History of Spring” are on sale now at the Speedway Box Office. 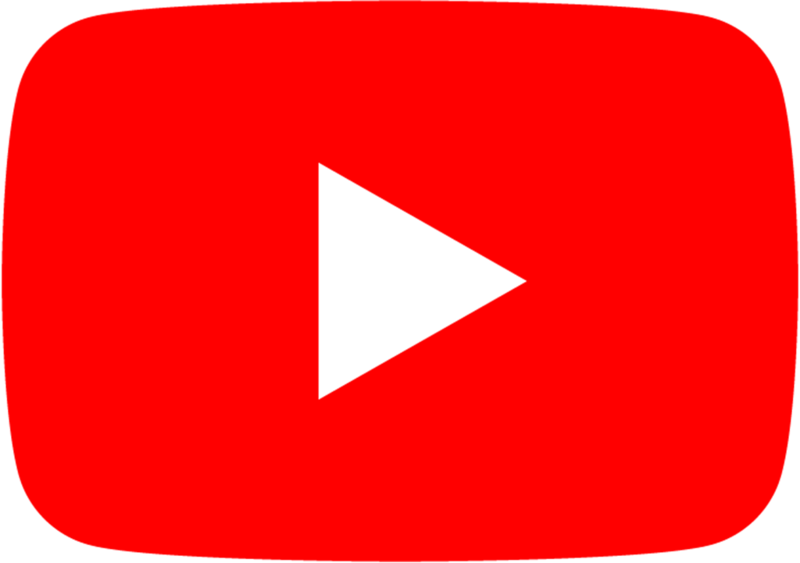 Tickets are priced at $40.00 for adult general admission tickets, $5.00 for children ages 6-14, and children ages 5 and under are admitted free of charge when accompanied by an adult. Reserved seating is priced at $42.00 for all ages. 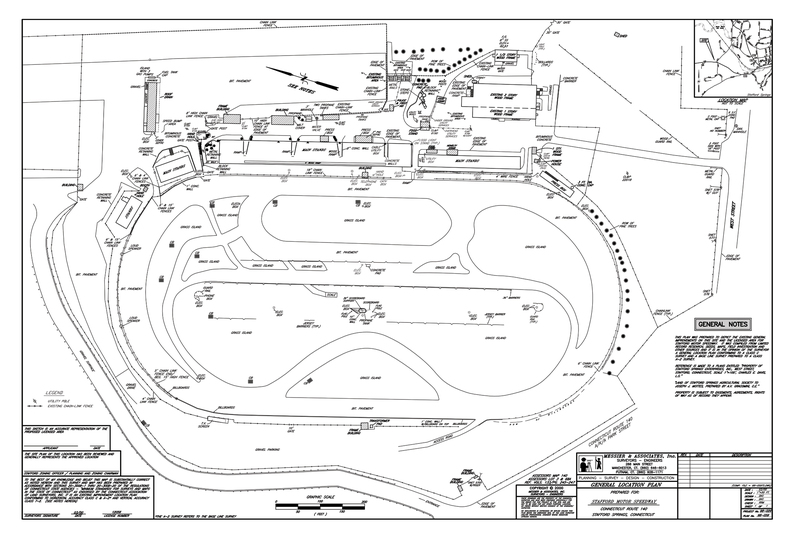 As always, Stafford Motor Speedway offers free parking with overnight parking available. All tickets are good for both Saturday and Sunday admission. All ticket prices include 10% CT Admission Tax. Discount Spring Sizzler® tickets will be available beginning the week of Monday, March 19 at participating NAPA Auto Parts stores. For more information contact the Stafford Motor Speedway track office at 860-684-2783 or visit us on the web at www.staffordspeedway.com.